Guys, it’s official. I am a homeowner. It’s scary and exciting, but mostly scary. Because truth be told, the house right now is far from perfect. The reality of homeownership is sinking in as I discover hidden corners of mold in the house, broken door knobs, and large gaping holes left over from the previous owner’s various wall hangings. Not to mention the fact that both the dining and living rooms are incredibly dark — it’s where light goes to die, and where I go to sit when I’m feeling stressed out by all the work I have to do. Yep, I think I just admitted to curling up in a dark corner and crying... on the internet. Realistically, I’ve always been more of a realist (ha, see what I did there?). I bought the house because it made financial sense in terms of rising rent prices, low mortgage interest rates, and its potential to appreciate in value over time. But the problem with seeing the world through such a mathematical lens is that sometimes the small things escape you. Sure, there was nothing majorly wrong and awful when I bought the house. And yep, it was still the right decision. But aside from being ready financially, was I emotionally ready to take on the responsibility of being a homeowner? That is, to spend hours of what limited spare time I have (between my job at a software company, this blog, and exercising, let me assure you, there’s not a lot of time to spare) and a significant portion of my income repairing holes in the walls and windows that have been painted shut? Well, even if I don’t currently know the answer to that question, it’s an answer that doesn’t really matter anyway. That is, emotionally ready or not, I’ve got the bank automatically withdrawing half my paycheck’s worth each month to pay for the damned thing. And you know what I’m going to do? What I always do, when I’m stress out and times are unsure. One of the things I like least about moving is clearing out the kitchen. It makes me realize how wasteful I actually am —think: forgotten, half-used bags of ingredients, bottles of spices from 2010, and moldy tupperwares full of scary things from the depths of the fridge. Although there were definitely the horrible (the worst being a metal tiffin full of leftover sushi from three months ago), there were some forgotten gems that I rediscovered: a small bottle of truffle olive oil from McEvoy Ranch, a tiny container of pink Himalayan salt, and a jar of high-quality pistachio paste leftover from that time I made pistachio madeleines. 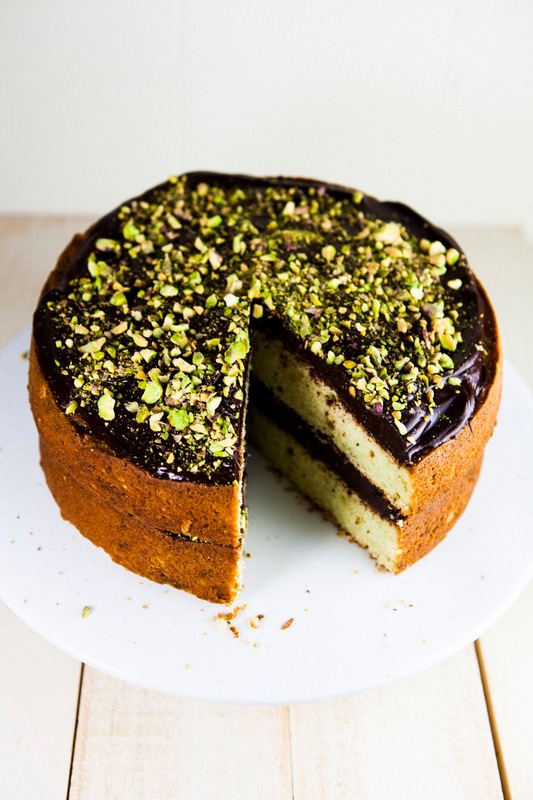 Staring at the pistachio paste, I realized that it was best to use it in a cake. After all, despite all my worries, buying a house at such a young age (by myself!) is cause for celebration. And what celebration isn't complete without cake, especially if chocolate frosting is involved? Pistachios are one of my favorite nuts. Besides their gorgeous green color, they have a pretty distinct and unique flavor that's best when paired with something that won't be overpowered by the pistachios — something like this dark chocolate ganache frosting. Together, the chocolate and pistachios create a wonderful marriage of flavors, perfect for those who adore the more common chocolate-nut combinations (like chocolate-almond, chocolate-hazelnut, etc). Admittedly, pistachio paste is expensive and a bit of a pain to source (though you can find some pretty good brands on Amazon). If you have a food processor, you can make your own at home! Homemade pistachio paste is a perfectly good substitute; any recipe you find online should work. The pistachio paste that I used was all-natural and didn't have any artificial food coloring, so I threw in a couple drops of green to get the pale green cake you see in the photos. 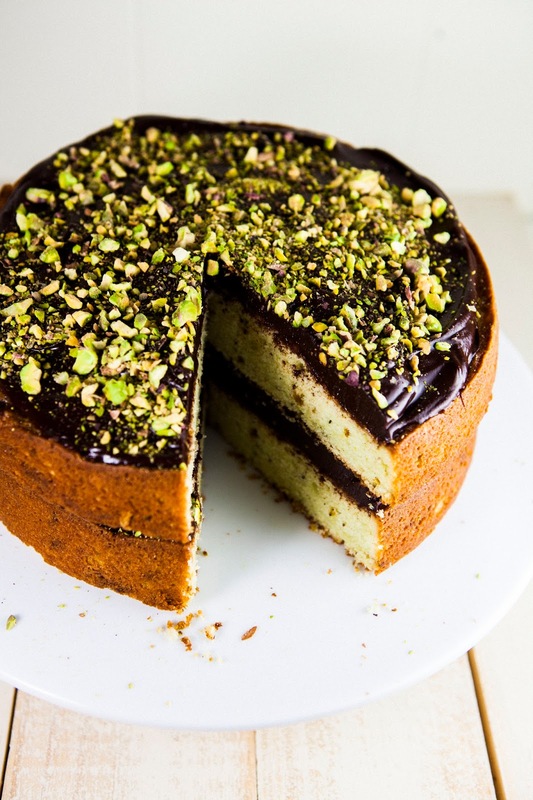 You can add more or less food coloring, depending on your preferences — most of the time, pistachio flavored cakes are a neon green, so feel free to add more. I also was a little scant with the chocolate frosting (that is, I only frosted the middle and the top) because I was running a little short on time. I used a really rich, chocolate frosting adapted from Miette Cookbook (also seen in this yellow birthday cake recipe), and found that the 3 cups of frosting that it made was more than enough for the cake since the recipe produced such a rich, high-quality ganache. However, some people just want more chocolate and I respect that! If you're one of those folks, please double the frosting recipe, cover the whole cake, and bask in that chocolate glory. Preheat the oven to 350 (F). Spray and line two 9-inch cake pans with parchment paper, spraying the parchment paper. In a medium bowl, whisk together 2 1/2 cups cake flour, 1 tablespoon baking powder, and 1/2 teaspoon kosher salt. Set aside. In the bowl of a freestanding electric mixer fitted with a paddle attachment, combine 1 cup (2 sticks) unsalted butter and 2 cups granulated sugar, creaming together on medium speed for at least 2 minutes, or until light and fluffy. Once the mixture is light and fluffy, lower the mixer to its lowest speed. Add 4 large eggs, one at a time, only adding the next egg after the previous egg has been fully incorporated into the batter. Once all the eggs have been incorporated, add 1 tablespoon vanilla and continue mixing until just combined. Continue to keep the mixer at its lowest speed and add the dry ingredients (from the 2nd step) in three additions, alternating with 1 cup sour cream in two additions, beginning and ending with the dry ingredients. After each addition, beat until just combined — DO NOT OVERMIX at this stage, or you'll end up with a dense, tough cake that will make me sad. Once the last of the dry ingredients have just been incorporated into the batter, turn off your mixer. Use a rubber spatula to fold in 1/2 cup pistachio paste, making sure to not overmix the batter. Once the pistachio paste has been fully incorporated and the batter has an even, slightly grainy texture, stir in 1/2 teaspoon green food coloring until just combined. There will be a lot of batter at this point, so don't worry if it takes some time to fully incorporate the food coloring. Once the batter is an even green color throughout, divide the batter evenly betwen the two pans and spread the batter out evenly with a rubber spatula. Gently tap each filled pan on the counter 4 or 5 times to remove any air bubbles in the batter. Bake the cakes in the preheated oven for 35 to 45 minutes, or until the top is nicely browned and a skewer inserted into the center of the cake comes out clean. When poked with your finger, the top of the cakes should gently spring back. Transfer to a wire rack and allow to cool completely before frosting and assembling. Combine 10 ounces dark chocolate and 2/3 cup confectioner's sugar in a medium, heatproof bowl. In a small saucepan over medium heat, bring 3/4 cup plus 1 tablespoon heavy cream to a gentle simmer, whisking occasionally. Pour the hot cream into the heatproof bowl containing the chocolate and confectioner's sugar mixture (from the 1st step). Stir the mixture with a heatproof rubber spatula until the sugar is dissolved. Once the sugar has dissolved, make a double boiler by nestling the heatproof bowl over a medium saucepan filled with water — be sure that the water in the saucepan doesn't touch the bottom of your heatproof bowl. Gently cook, stirring with a heatproof rubber spatula, until all the chocolate has melted and the mixture is smooth. Remove bowl from the heat. In a separate, smaller heatproof bowl, whisk together 2 large egg yolks. Temper the yolks by pouring about 1/2 cup of some of the melted chocolate mixture (from the 3rd step) into the yolks, stirring constantly. Pour the tempered mixture back into the larger, heatproof bowl containing the rest of the original mixture and whisk to combine. Add 3 tablespoons unsalted butter and continue whisking until smooth. Allow the ganache to cool for about 10 - 15 minutes, before using immediately. 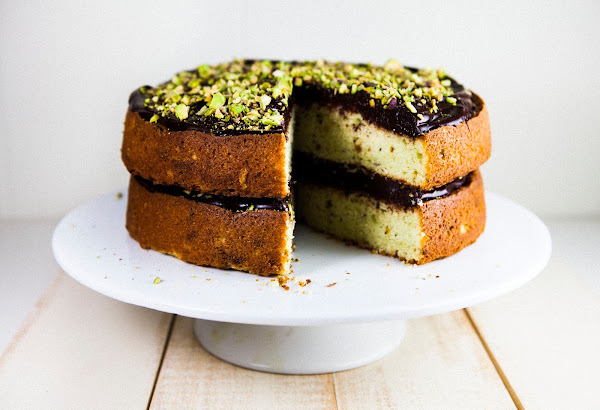 Spread around 1 1/2 cups of frosting at the top of each layer and sprinkle each layer with 1 cup finely-ground pistachio nuts. Gently nestle one layer on top of the other and voila! A two-layer cake. Enjoy! Congratulations. You can do it. There is no such a thing as a bad decision, just bad handling the outcome. I must admit the thing I like the most about moving is actually cleaning and throwing away things I was gathering, it is so much easier to do when you actually need to and then this feeling of fresh start. My friend LOVES pistachio... I may just have to save this recipe until his next birthday! Yuum this looks like the two best gelato flavours melded into cake form. Good luck with the house! congratulations on becoming a home owner! 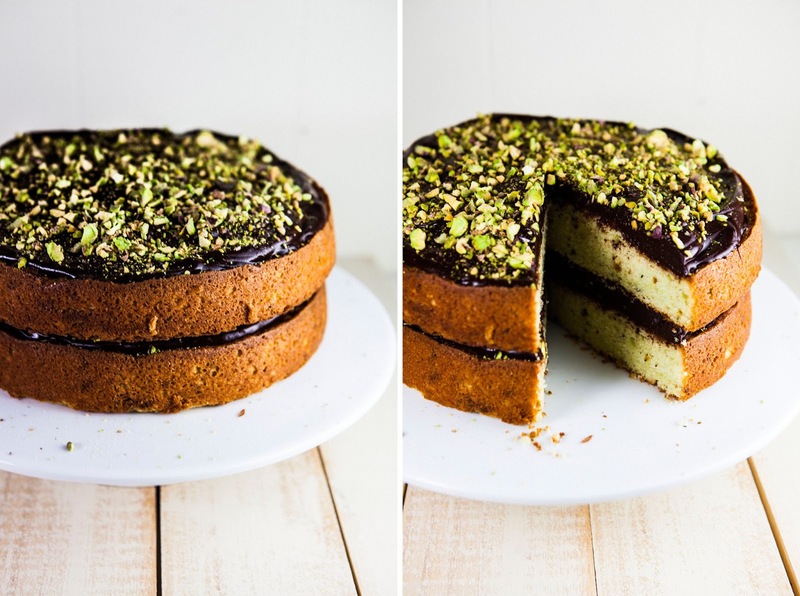 this cake is beautiful, pistachio and chocolate are an amazing pairing! I love the green of the pistachio's they are such a lovely nut to use. Don't worry about the stress of house life, you'll get there in your own time :) . Hi Michelle! I'm a new reader to your blog, and think it's just lovely. I'm making this cake right now...a practice run for a wedding cake on Friday. 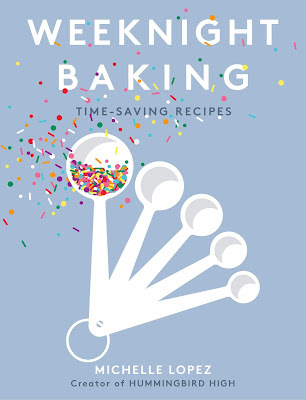 Do you think the frosting can be made ahead of time, refrigerated, and then slowly warmed later to spread on the cake? I've never made a frosting with egg yolks in it, so am not sure how it will behave. Thank you for the beautiful recipe! hey Michelle. I have to say, this looks amazing! I want to make it for my dad's birthday in august but here in Colombia, pistachio paste has been impossible to find. Most homemade pistachio paste recipes call for a food processor, but do you think I could use a common blender? Also, in Colombia, its impossible to buy unsalted pistachios, so in this case would just washing them really thoroughly before using them be alright? And last of all, I have a really old electric mixer and it does not have a paddle attachment (in fact, only one of the little arms works). So I think I would have to do those steps by hand. What I'm saying is, do you think it's impossible for me to bake this? I hope not, I really want to try it. thanks for the recipe! Pistachio paste is a bit hard to find, so I definitely feel your pain! I've never made pistachio paste using a blender before, but I'm sure it could do the trick. I would crush them up as much as possible (that is, put them in a ziploc bag and use a rolling pin or a hammer to smash them) before putting the crushed pieces into the blender and giving it a good whirl. I'd also only put a few tablespoons of crushed pistachios in at a time, to get the pieces as small as possible. 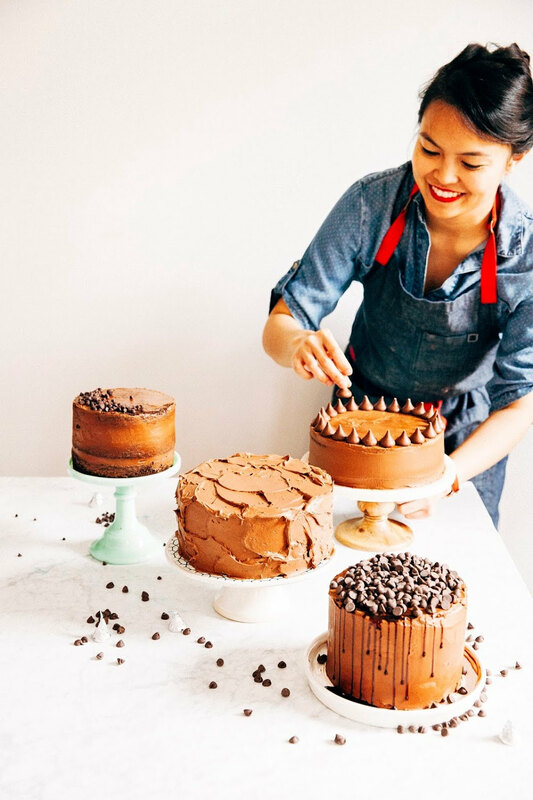 You can definitely make the cake with an old electric mixer or a handheld whisk, so I wouldn't worry about your mixer too much! Good luck with the project! I really hope you get a chance to make this cake. Let me know how it turns out! Hi there! My name is Jessica, and I run a food blog called Floptimism. Every week, I write a Weekend Wrap-Up where I share some of my favorite blog posts, recipes, and articles from the past week. 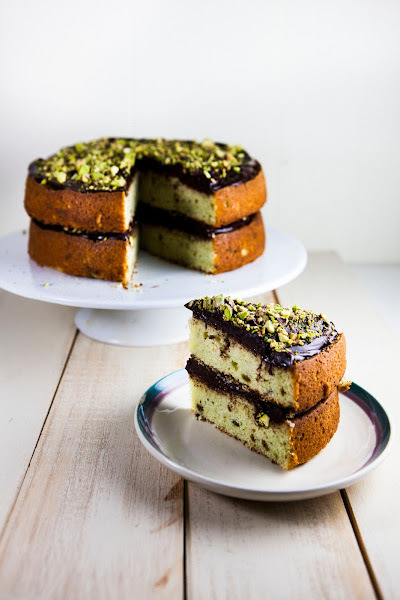 I absolutely fell in love with this cake - the pictures are breathtaking and I love that it's pistachio without being NEON green - and wanted to let you know that I featured it this week. If you're interested, I've left the link below. Thank you for such a beautiful post, and I hope you have a great rest of your weekend! I actually really like that you didn't frost the outside of the cake. It does give it a rustic look. looking forward to trying this recipe out :D Thanks for posting! Hi! I tried baking this cake using cake flour as mentioned in the recipe. I bought the vanilla cake flour from bulk barn. However, the consistency of the cake didn't come out right and didn't even bake completely. It turned out to be more pudding like than a cake. I want to try the recipe again and just wanted to check if using regular all-purpose flour would be okay for the recipe? Thanks! !